SabrEx™ for Corn brings the benefits of ABM’s™ iGET™ Technology package to your corn crop. Tested across the U.S. Midwest under a wide variety of field and fertility conditions, SabrEx™ for Corn has been shown to create more robust root systems, induce resistance to plant stresses like dry weather or disease, and increase water and nutrient efficiency. Yield data over the last 4 years have averaged an 8.53 bu/a yield increase. That’s a 6:1 return on investment. 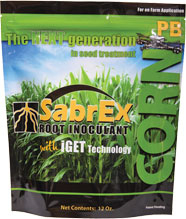 SabrEx™ for Corn is a unique formulation of two (2) carefully selected, specific, patent pending, proprietary biological fungi strains called Trichoderma. Trichoderma colonizes with the plants root system and develops a symbiotic relationship with the plant. The Trichoderma feed from the starches and sugars produced by the plant; while exuding beneficial enzymes and proteins for the host plants use. As a result the plant produces a larger root system, improves resistance to stresses such as diseases, and improves its nitrogen and water use efficiency, thus resulting in higher yields. The Trichoderma found in SabrEx™ for Corn stimulates root growth, competes with root pathogens, enhances nutrient utilization, and increases stress tolerances. 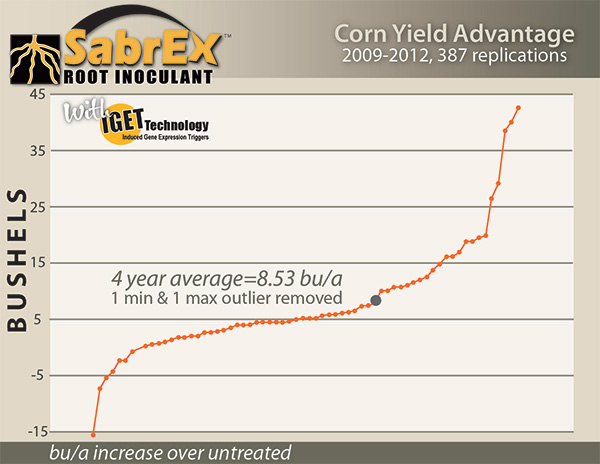 In the summer of 2012 SabrEx™ for Corn was put to the test during drought conditions and performed remarkably. One pail treats 24 bags of corn seed.